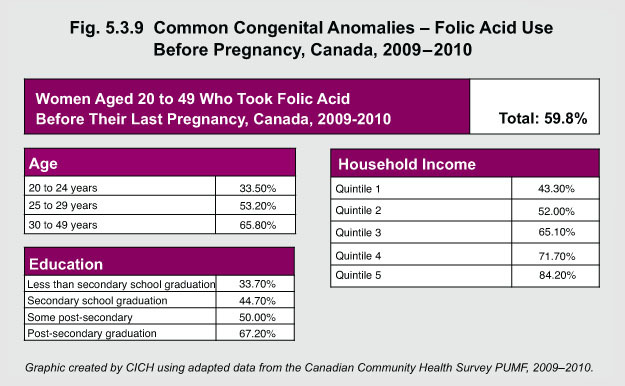 According to the 2009–2010 Canadian Community Health Survey, nearly 60% of women aged 20 to 49 years reported taking folic acid before their last pregnancy. However, access to folic acid and prevention of neural tube defects is not equal for all women. Women aged 30 to 49 years were more likely to take folic acid than were younger women. Two-thirds of women with a post-secondary education took the supplements compared to one-third of those without a high school diploma. Moreover, 84% of women in the highest income households took folic acid compared with only 43% of women in the poorest households.